A fairly common to common, yearlong resident throughout most of California, with a few exceptions. 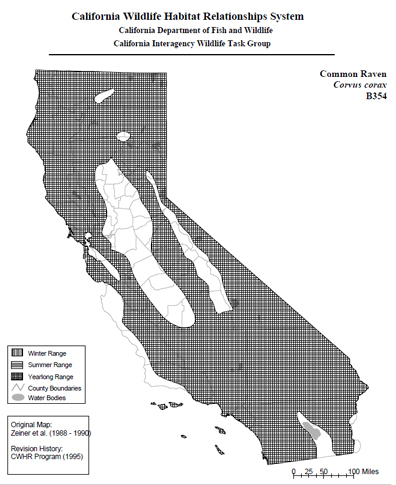 Rare in the Central Valley, at high elevations in the Sierra Nevada, and along the central California coast (Santa Cruz to Santa Barbara cos.). Numbers appear to be increasing in the northern Sacramento Valley and the Cascades (McCaskie et al. 1979). Found at all elevations throughout the state. Some downslope movement in mountains in winter (Gaines 1977b). Occurs in most habitats. Resident on the Channel Islands (Garrett and Dunn 1981). Nested regularly on the Farallon Islands until extirpated in 1911 (DeSante and Ainley 1980). Feeding: Eats carrion, small vertebrates (including mice and rabbits), bird eggs and young, insects, seeds and grains, nuts, and berries and other fruits (Bent 1946). 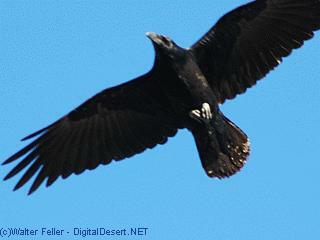 Gleans from the ground, searches for food in flight, and pursues prey. Caches food. Ejects pellets. Cover: Trees and cliffs in a wide variety of habitats provide cover. Roosts in colony at night, mostly in trees. Reproduction: Nest is a mass of twigs and sticks bound with earth and moss and well-lined with soft vegetation and hair (Harrison 1978). Nest usually placed on cliff or bluff, but also in a tall tree or human-made structure. Mostly 6.1 to 30 m (20-100 ft) above ground. 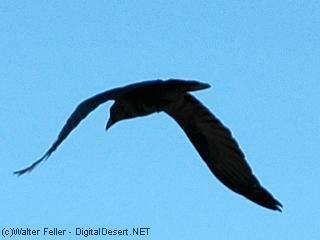 On cliff, may nest within 100-200 m (350-700 ft) of prairie falcon nest (Dawson 1923, Mewaldt personal observation). Sometimes uses old raptor nest (Airola 1980). Pattern: Grinnell and Miller (1944) noted 2 features usually present in occupied habitat: large expanses of sparse, open terrain for foraging, and cliffs, bluffs, or sea walls for nest sites. Seasonal Movements/Migration: Mostly a yearlong resident. May wander or move downslope from high elevations in winter. Little information available about movements or other aspects of life history of populations in western U.S., especially in mountainous areas. Home Range: In Wyoming, home range averaged 938 ha (2317 ac), varying from 680-1080 ha (1680-2668 ac) (Craighead and Craighead 1956). In Great Britain, breeding density reported as 1 pair per 17-46 km² (6.6 to 17.6 mi²) (Ratcliffe 1962). In Virginia, 1 pair per 29 km² (11 mi²) reported by Hooper et al. (1975). Territory: Defends a territory, but no data found on size. Reproduction: Pair nests solitariIy from mid-February into July with peak activity in May and June. 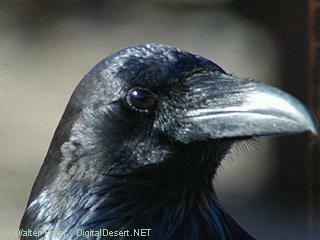 Lays 3-7 eggs, usually 4-6; incubated by female for 20-21 days. Male feeds incubating female. Altricial young tended by both parents. Nestlings fledge at 5-6 wk (Harrison 1978). 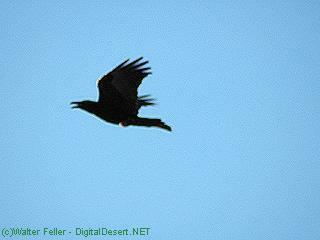 Niche: Preys on bird eggs and young as well as on small vertebrates. Also feeds on carrion and at dumps. 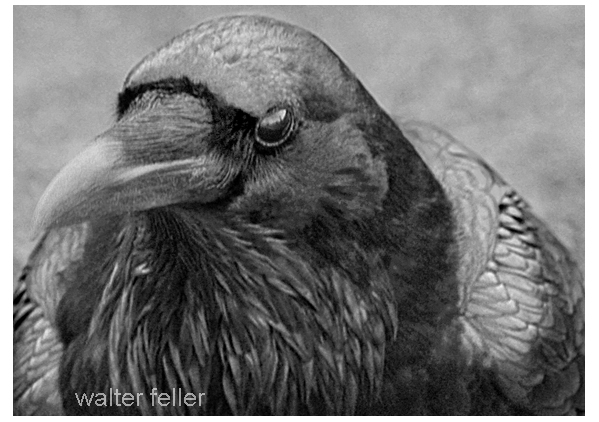 The murderous-looking jetblack Raven (Corvis corax) average about 24 inches in length and have a fan-shaped tail rather than the square tail of their cousins, the crows. They are omnivores but prefer animal over vegetable foods. 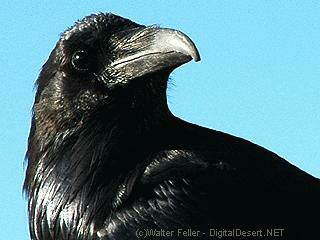 They often eat carrion but have been known to attack live lizards, snakes, insects and nesting birds. They most often travel in pairs.